Michel Gagné is probably better known in animation fandom than in furry fandom. His major credits include animation on the feature films An American Tail and All Dogs Go to Heaven for Don Bluth Studios in the 1980s; on Quest for Camelot, The Iron Giant and Osmosis Jones for Warner Bros. in the 1990s and early 2000s; and on The Incredibles and Ratatouille for Pixar in the 2000s. Gagné has worked on Star Wars: The Clone Wars and other TV and video game animation projects. His personal animated short films such as the 1995 Prelude to Eden (video) have often been nominated for the animation industry’s Annie Awards. In comic books, DC Comics has asked Gagné to write and draw a Batman serial. In 1997, he began self-publishing picture and comic books with his first Rex book, A Search for Meaning: The Story of Rex. His books earned Ursa Major Award nominations in 2002, 2005, and 2006, for the colored edition of his first Rex book and for two issues of his comic, ZED. In 2004 Gagné was invited to create a story for annual comic-book anthology Flight, edited by Kazu Kuibishi and (then) published by Image Comics. 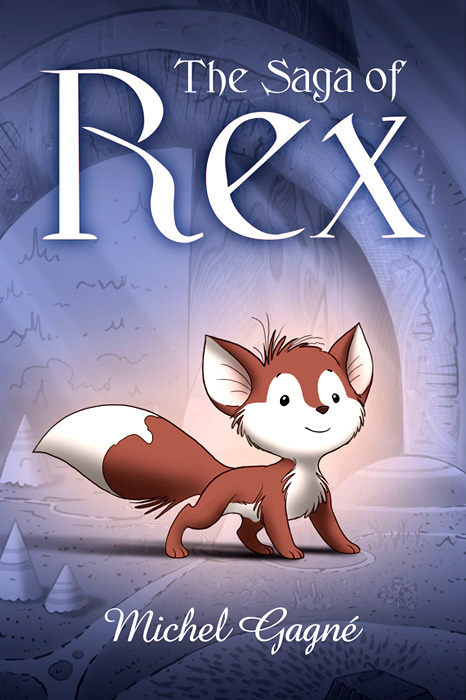 Gagné wrote and drew a second story with his fox cub Rex, The Saga of Rex, serialized in Flight #2–7. Now Image Comics has collected the story into a 200-page full-color trade paperback, printed on high-quality paper. It’s only borderline anthropomorphic, but Gagné’s first Rex book did get enough nominations from furry fans to make the final ballot for the Ursa Major Award (for Best Anthropomorphic Other Literary Work) in 2002, so many furry fans should enjoy the longer The Saga of Rex even more. Damnit, I had a review of that all written up that I'd been keeping in reserve for Anthrozine! I'll post it in a new comment, that way people can get two reviews at once. :) I was worried something like this might happen after it was mentioned on CartoonBrew. This is an engaging comic about a little fox who gets whisked away to fantastic adventures by alien technology. It's surreal and yet so cute! If Disney and Jim Woodring's Frank comics had a love-child, it would be something like The Saga of Rex. Think light psychedelia. Design is what makes this comic work. Michel Gagné is both a cartoonist and an animator with years of experience behind him. All Dogs go to Heaven, The Iron Giant... actually some of you may have seen him at Anthrocon 2004, where he was Guest of Honor. No? How about this - you know that scene in Ratatouille where Remi's experiencing what he's tasting, represented by all kinds of abstract lights and swirls around him? That's Michel's work! And because of his professional background, the surroundings in The Saga of Rex are just as important and evocative as his character designs, forming a united whole. Ultimately what this comic is about... is left entirely to the reader. For me, it's about adventure, courage and love. However, aside from some opening narration, there's not a single word spoken in all 200 pages, so how you personally interpret the story is up to you. It originally appeared in serialized form in volumes 2-7 of Flight, a well-chosen comics anthology that can be found in some libraries. An earlier work with Rex also exists, A Search for Meaning: The Story of Rex (2002). You know what, let's keep this review short. This is one of those comics that's very visual, making it hard to describe. It really speaks for itself, and since 40% of it can be viewed on Gagné's website, go take a look! And if you like his artstyle, you can also check out a computer game featuring his artwork, Insanely Twisted Shadow Planet (currently available on XBLA - more info here). That is the most adorable fox I've ever seen. And just when I was about to do a research on this! At least now I know there are two books. However, now when I am determined to collect all Flight books, will buying the second Rex story be necessary?..